A Confederation Log Home is a green home. After all, it’s made from nature’s finest renewable resource – wood. Our log cabins are energy efficient by design – from our airtight construction to placement on your lot taking advantage of sun and shade, a log home provides a classic appeal with all the latest technical and environmental advantages. 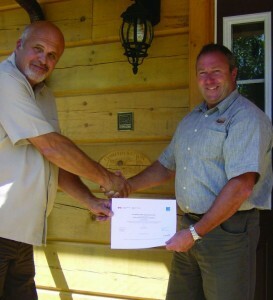 In fact, 1867 Confederation Log & Timber Frame is the first log home manufacturer in Canada to receive Energy Star approval. Confederation has a history of innovative technology and is also the only log home in Canada to have received a CCMC rating that exceeds requirements for allowable air tightness so it wasn’t a challenge to conform to the requirements of the Energy Star system. We want to assure you of our ongoing commitment to innovation, energy efficiency and our respect for the environment in all aspects of our business. Any seconds of raw material is cut into useful shop material such as stickers (used to dry the logs), wood work horses to build the timber frames on, etc. Turn heat down each evening and weekend. This Log Home Seminar could change your life! Your email is 100% safe with us - we will never share your email with anyone else and you can unsubscribe at any time.